The best expression of being productive is completing tasks. Even better is completing tasks in pursuit of your most important projects and needs. Quite frankly, productivity is about getting things done. But how can you measure your productivity? Is about productive time? Efficiently getting things done or productive output? Or something else? Arguably, the two biggest areas that are typically obsessed by self-trackers and quantified self enthusiasts are health and productivity. Tracking health might be captured in logged workouts, body composition, step counters, heart rate monitors, HRV, blood testing or glucose monitoring among others. These are essentially a mix of biomarkers and metrics gauge how health or fit you are, and, to a certain extent, they are objective measurements. They can be linked to medical research, compared with general populations and demographics and charted over time. For productivity, it is much more difficult to reach objectivity. The metrics of productivity depend on what you do, how you spend your time and the things are trying to achieve. Everyone is different, and so the measurements of being “productive” varies from person to person. While there might be the same level of shared biomarkers when it comes to productivity, fortunately there are a few tools that make it possible to track several areas of your life, like your time usage, computer usage and tasks completed. By using these tracking tools and tweaking the settings, you can come up with your own personal guidelines to score how productive you are and were over a day, a week or even a year. This post will look at productivity and the tracking of your tasks. Specifically by using a task management tool like Todoist, you can pull out your data on completed task and clearly notice periods of higher productivity, by which I mean periods where you are getting more things done. When it comes to tracking and personal data, it’s also important to engage with your data. Merely tracking does little to improve or change your behavior. So we will also look at a few ways I engage with my tracked tasks data to improve my productivity. 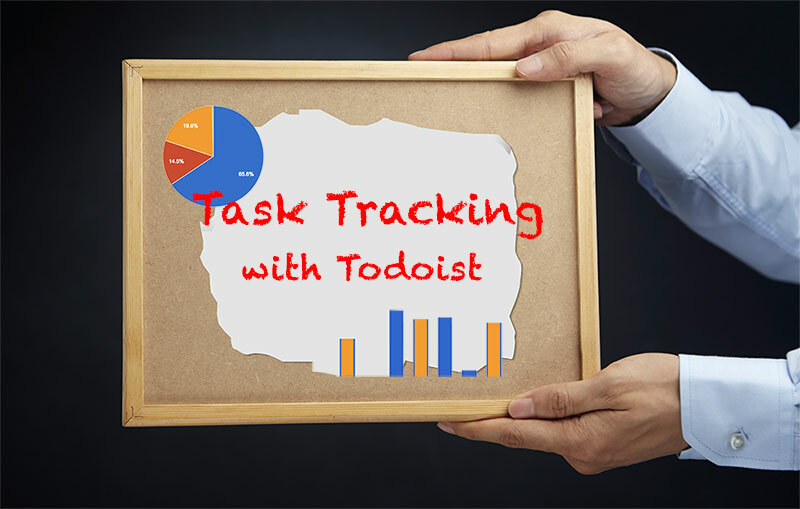 NOTE: This post focuses on Task Tracking with Todoist. If you are interested in knowing more about using Todoist as part of a productivity system like GTD, please see my post, “Getting Things Done With Todoist”. 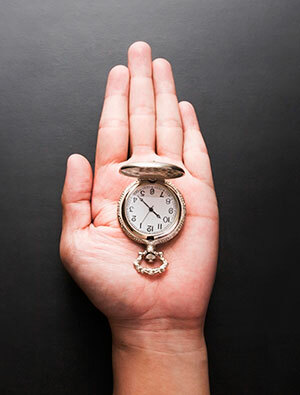 Time tracking is probably the most common method used to measure productivity. By tracking your time, you can see if you are putting your time to good usage. You can track it passively using a tool like RescueTime which looks at which sites you visit and which applications you are on to determine how productive you are. By tweaking the scoring for different applications and tools you can even adjust to your work and what applications are productive or not for what you do. The other route is manual time tracking. Manual time tracking is the process of turning a stop watch on and off as you work on different tasks. This allows you to know how focused you were on certain areas, regardless of the tools involved. I use Toggl but there are dozens of time trackers depending on if you want to track from your computer, phone or smart watch. Both passive and manual time tracking are good ways to see patterns in your time usage. But I’d argue that productive time as revealed through time tracking is more of a reflection of productivity, rather than the end goal. Time usage isn’t the “product” of being productive. The real product of productivity is getting things done. As such, what matters is your completed tasks. This idea of productivity in terms of focusing on getting things done fits perfectly with Paul Allen’s “Getting Things Done” book and methodology. 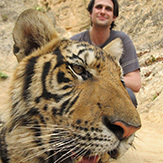 His methodology is a systematic approach to helping you complete your key tasks and mentally manage all the other stuff. Personally I use Todoist which is a flexible yet powerful task management tool. It also comes with a number of simple statistics trackers and ways to visualize what you are completing. Even better is that offers integrations and data exports so you own your data. You can use your data to understand your productivity in terms of the tasks you complete. So, while poor time management and unproductive time likely will have a negative impact on your ability to get important things done, it may not be the best measure of your productivity. Specifically, your work might require some negative time scouring the web or using Facebook or dozens of other less than ideal usages of your time, but if you are able to still focus regularly and consistently on your key tasks, then the product of being productive will happen: you’ll get amazing things accomplished. Todoist makes it easy to deal with task management. It’s main mission is helping you get stuff done without going insane. Todoist also keeps a record of every single task you complete. This is stored in the application and is also accessible through integrations, the API and exports. This makes it possible to look back on all of your tasks over time. This then opens up a history of your completed tasks and is a good way to see what you have done. You can look back at the steps taking in any project. One of my biggest complaints with other checklist and task managers like Wunderlist is that these programs don’t store your history of completed tasks and also don’t provide a way to export your past tasks. Todoist, by contrast, makes it easy to find your history of completed tasks, export your usage and even goes a bit further. Todoist has a tab for looking at your productivity and trends for completed tasks. This is called “Karma.” Karma is a scoring system to look at how good you are at completing tasks. You can get both the overall number of completed tasks as well as your “mastery” level. While Todoist is nowhere near as robust of a gamification system as Habitica, it does incentivize the good habit of completed your tasks on a daily and weekly basis. What I particularly like is having a goal of number of tasks to complete over a period and then seeing my progress at hitting this. Todoist offers a daily goal and a weekly goal, so depending on your work processes you might use one or both. Since I work with a flexible schedule, I look more at the weekly task goal. My personal goal in Todoist is to get 25 completed tasks per week, but actually I aim to get closer to 40 tasks completed per week. I also like the color-coded daily and weekly chart on completed tasks. This makes it easy to see trends too. Though it’s difficult to decode what colors represent what, you can see a rough distribution of your tasks. Overall, Karma is not as sophisticated as other gamified task and habit trackers like Habitica. That said, combining an archive of completed tasks, basic statistics and tracking and you have a pretty good access to see how productive you are in terms of getting things done. Also since Todoist provides access to your logs as an export and through its API, it’s easy to go even further with statistics and tracking. Todoist is my preferred task management tool for a number of reasons, like ease of getting everything into the system via web and mobile application and its tools for smart prioritization and setting up due dates. It also looks nice and has good tracking. As a self-tracker, one of the features I also look for in a tool is access to my data. Nothing is worse than a tool that works great but locks you in and limits access to seeing your usage. Fortunately Todoist really shines in providing users with exports, completed task logs, an API and great existing integrations. With Todoist you really do own your data. By leveraging a couple integrations, we can pull our data into other systems and engage with your data. In this section we will pulling completed tasks out of Todoist using IFTTT and into Google Sheets. Once in a spreadsheet, we can look at trends and week-by-week tasks. IFTTT (aka “If this, then that”) is probably the most used service on the internet for wiring together different services. By using events and actions in one system, you can then trigger an action in another. For example, you track a run in RunKeeper and IFTTT can then post a message on Twitter or store a log in a spreadsheet. There are hundreds of recipes to mix and match and do some interesting things. There are a lot of great options for leveraging Todoist and IFTTT. For the full list see: ifttt.com/todoist. 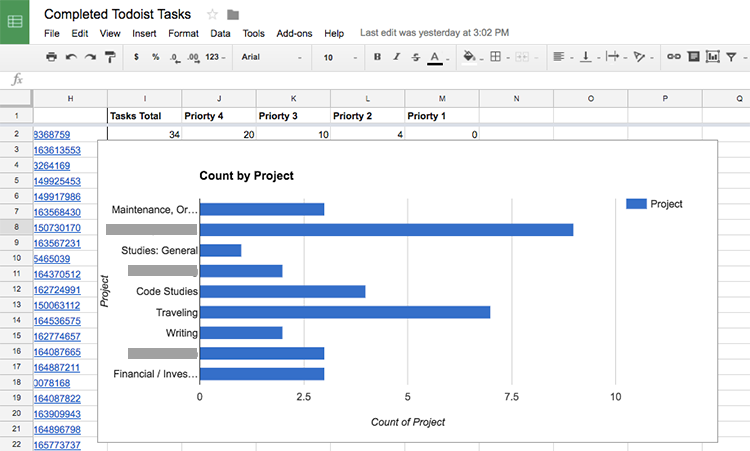 My favorites are keeping a completed tasks log in Evernote and Google Sheets. With Evernote integration, I have setup project-specific Evernote notes that log all the completed tasks accordingly. A completed, client task gets logged to a project-specific note in Evernote. This allows me to easily access past work throughout Evernote’s search. As a tracker though, my main usage of IFTTT integration is with Todoist and Google Sheets. Essentially with most tracking you eventually want to look at your data in a spreadsheet. You could pull this data out in a direct export, but with IFTTT, completed tasks can get logged upon completion immediately into a designated place in Google Drive. 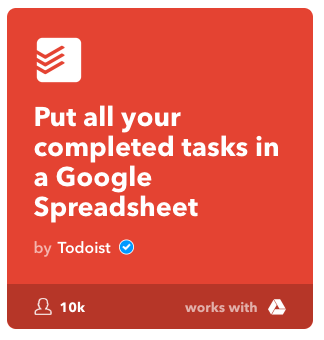 On IFTTT, search for Todoist or the recipe “Put all your completed tasks in a Google Spreadsheet.” With some simple configuration, you can set the name of the spreadsheet and where in Google Drive it will be stored. This integration brings all my completed tasks into a single log. So each time a task is completed a new line is added into your spreadsheet. Your document will include the task name, project, when it was completed, any labels, priority and a link to the task. This data then allows you to create simple charts and other data analysis. Todoist and IFTTT has a number of other nice integrations. Todoist provides an option to receive a daily list of tasks for the current day and a summary of the previous day’s completed tasks, but with IFTTT you can create an aggregate weekly email too. Todoist using IFTTT can be integrated with Email, Google Calendar, Pocket and many others. While many self trackers spend a lot of time tracking and logging, many fail to engage with their data. Tracking without data analysis and experimentation is not particularly meaningful. In fact, just tracking without engaging might simply be a form of obsessive compulsive behavior rather than an attempt at personal betterment and self-transformation. So it is important to regularly engage with your data. Once you have your data in Google Sheets there is a lot you can do with it. You can look at completions over time, create charts of which projects have the most completed tasks, and visualize your data to better understand how you work and what you complete. Also by creating charts and moving your better around, you start to engage with it, understand it and make it transformational. A tutorial of Google Sheets is beyond this post, but here are a few examples of charts you can create. This chart can help you see where you are getting your most tasks done. 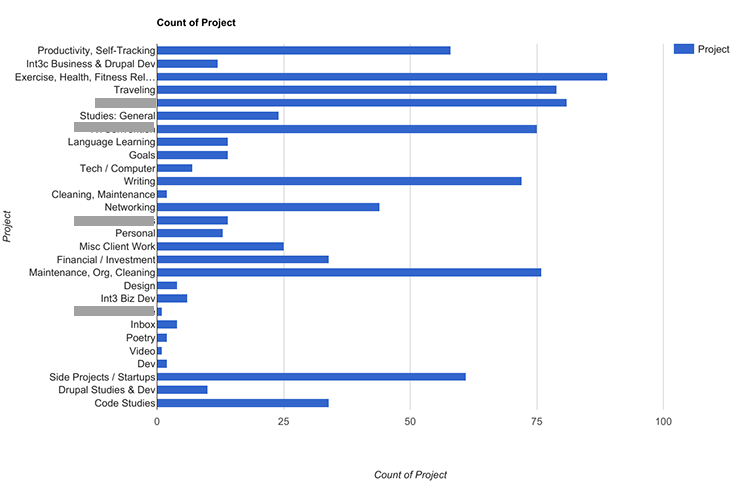 Select the “Project” Column, click the chart icon, and select the chart type to create a chart of tasks completed by projects. This chart can help you visualize if you are falling into the trap of doing just simple, low priory tasks or if you are finding the energy and focus to tackle your high priority, important tasks. To create this chart, select the “Priority” column, click the chart icon and select the chart type. I’m a big believer in the “Power of the Weekly Review”. Weekly Reviews are my way of processing how well the previous week went and planning for the week to come. It’s a great way to process all the madness built up over a busy and active week of work. It both helps me see patterns in my life, health and work but also helps me to improve my processes week to week and set clear priorities for the week to come. Over the past year or so, my weekly reviews have become increasingly data driven. I pull in data from different sources to get a broader overview of my past week. When it comes to productivity tasks completed is an incredibly valuable data point. Once the basic tasks data lands in a spreadsheet, I sort it by week and get a few aggregate numbers and a couple of charts to visualize it. For me, the weekly numbers don’t matter except in comparison to my general trends and comparison to the week before. I want to be getting things each and every week. So, a drop in number of tasks completed or a decrease in higher priority tasks completed is a clear sign of a change. Context matters when it comes to any data point. So a decrease in tasks might mean any number of things. I might be traveling, sick, burned out or even depressed. I might be feeling unmotivated or lack a good project to engage me. These are things I have to consider and provide as context for a change in my weekly number of completed tasks. Fortunately by having this data point and a few others makes it possible for my weekly review to pinpoint what’s up. 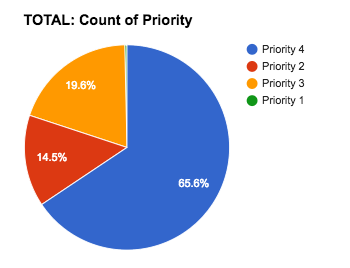 Todoist’s Priority Tasks: Are you Getting the Important Stuff Done? One thing we haven’t mentioned is priory tags. Along with the ability to set a project, a tag or a due date on your tasks, Todoist also lets you set task priority. There are four levels and by default tasks are set at Level 4. The highest priority is 1. In my case, there are certain tasks that are more important or require more focused work. These I label accordingly as Level 2 or Level 3 tasks. Todoist then sorts task according to priority for that date. When it comes to productivity and tracking, knowing how many tasks you completed in a week can be a key metric. But by getting both a lot of things done and a higher percentage of priority tasks you can avoid the trap of merely checking off easy tasks and avoiding the hard stuff. One of the things I believe that best drives a high octane, personal productivity system is focusing your highest value-driving tasks and projects. It’s up to you to make this calculation on what you value most and which projects need to be prioritized. You should periodically pause to set the right compass. For me the main time I do this is in my Annual Review. By combining a year-long perspective with a weekly, monthly or quarterly review, you have a chance to check-in on your targets and re-aim according to what is most important now. Your job with your task management is to focus on those key areas. By using a tool like Todoist you can pull out statistics to see if your priorities are aligned with what you are getting done. In this post we focused on productivity in terms of tasks completed. While tracking your time usage can also help you visualize how productive you are over time, I’d argue that it’s most important to focus measuring and understanding your tasks completed and projects advanced. Fortunately a tool like Todoist makes this quite easy. By using Todoist to manage your tasks and priority projects, the main thing you achieve is that you get more efficient at getting things done. 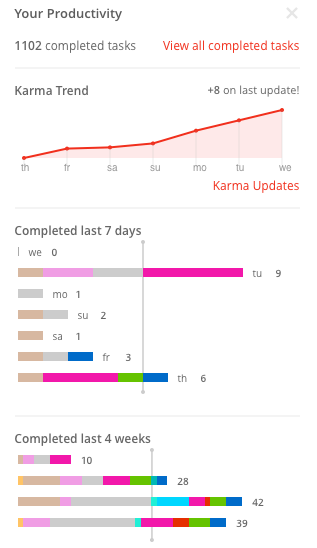 The side bonus with Todoist is you get a lot of data back to help you see how you are doing. Todoist provides simple visualizations of tasks completed per day or week and you even get a Karma score of your tasks over time. But the biggest value comes from the data you can export or integrate from Todoist. By engaging with your data, which is a portrait into your life and activities, you can start see patterns, pose questions and start self-experiments to develop and self-improve. Personally tasks completed is an important area to focus on, since by getting the right stuff done in less time, you are being as purely productive as you can be. By contrast if you don’t get things done, then you are not being productive and in fact almost all aspects of your life might suffer. For me there are a lot of areas of my life I track and micromanage but one of the most important are my tasks and projects. The data and understanding I get back by consistently engaging with my tasks, habits, projects and goals has lead to huge life improvements. And when it comes to productivity, completing tasks has made me an expert at getting to the product of productivity: tasks completed, projects advanced and goals achieved.